Multiattack. The scorpion makes two attacks with its claws. Claws. Melee weapon attack: +4 to hit, reach 5 ft., one target. Hit: 6 (1d8 + 2) slashing damage. Sting. Melee weapon attack: +4 to hit, reach 5 ft., one target. Hit: 4 (1d4 + 2) piercing damage and 5 (1d6 + 2) poison damage. The target must make a DC 12 Constitution saving throw or be poisoned. The target may repeat its saving throw at the end of each of its turns, ending the poisoned condition on a success. Multiattack. The scorpion makes two attacks with its claws and one with its sting. Claws. Melee weapon attack: +6 to hit, reach 5 ft., one target. Hit: 10 (1d12+4) slashing damage. Sting. Melee weapon attack: +6 to hit, reach 5 ft., one target. Hit: 8 (1d8+4) piercing damage and 7 (1d6+4) poison damage. The target must make a DC 14 Constitution saving throw or be poisoned. The target may repeat its saving throw at the end of each of its turns, ending the poisoned condition on a success. Claws. Melee weapon attack: +7 to hit, reach 5 ft., one target. Hit: 10 (1d12 + 4) slashing damage. Sting. Melee weapon attack: +7 to hit, reach 5 ft., one target. Hit: 8 (1d8 + 4) piercing damage and 11 (2d6 + 4) poison damage. The target must make a DC 14 Constitution saving throw or be poisoned. The target may repeat its saving throw at the end of each of its turns, ending the poisoned condition on a success. Radioactive Aura. A creature that begins its turn within 10 feet of the glowing radscorpion takes 6 (1d12) radiation damage. Radioactive Glow. The glowing radscorpion sheds bright light in a 20-foot radius and dim light for an additional 20 feet. Claws. Melee weapon attack: +7 to hit, reach 5 ft., one target. Hit: 10 (1d12+4) slashing damage and 7 (2d6) radiation damage. Sting. Melee weapon attack:+7 to hit, reach 5 ft., one target. Hit: 8 (1d8+4) piercing damage, 7 (2d6) radiation damage, and 11 (2d6+4) poison damage. The target must make a DC 15 Constitution saving throw or be poisoned. The target may repeat its saving throw at the end of each of its turns, ending the poisoned condition on a success. Multiattack. 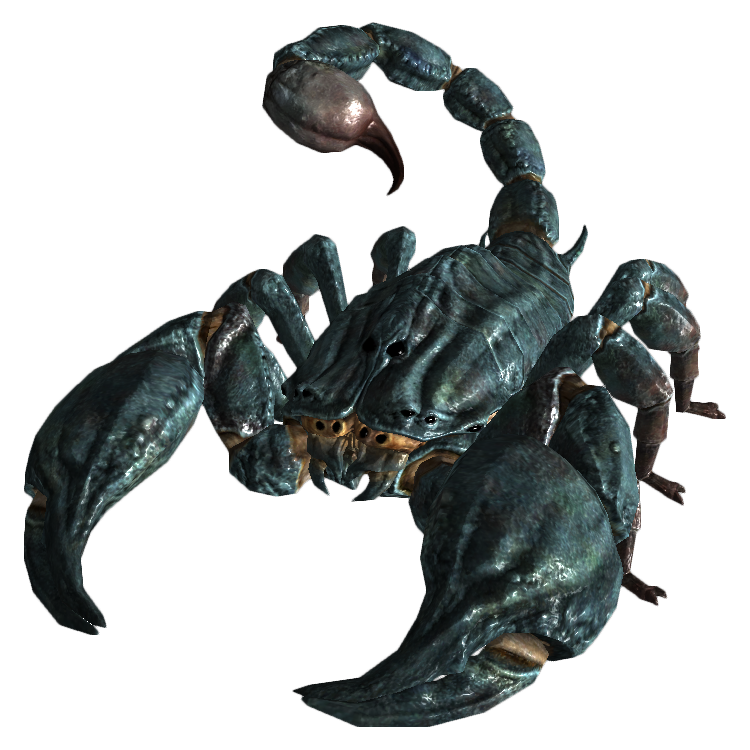 The scorpion makes three attacks with its claws and one with its sting. Claws. Melee weapon attack: +8 to hit, reach 5 ft., one target. Hit: 13 (2d8+4) slashing damage. Sting. Melee weapon attack: +8 to hit, reach 5 ft., one target. Hit: 9 (1d10+4) piercing damage and 15 (2d10+4) poison damage. The target must make a DC 16 Constitution saving throw or be poisoned. The target may repeat its saving throw at the end of each of its turns, ending the poisoned condition on a success. Multiattack. The scorpion makes four attacks with its claws and one with its sting. Claws. Melee weapon attack: +9 to hit, reach 5 ft., one target. Hit: 13 (2d8+4) slashing damage. Sting. Melee weapon attack: +9 to hit, reach 5 ft., one target. Hit: 9 (1d10+4) piercing damage and 15 (2d10+4) poison damage. The target must make a DC 16 Constitution saving throw or be poisoned. The target may repeat its saving throw at the end of each of its turns, ending the poisoned condition on a success. Claws. Melee weapon attack: +10 to hit, reach 5 ft., one target. Hit: 14 (2d8+5) slashing damage. Sting. Melee weapon attack: +10 to hit, reach 5 ft., one target. Hit: 11 (1d12+5) piercing damage and 16 (2d12+5) poison damage. The target must make a DC 18 Constitution saving throw or be poisoned. The target may repeat its saving throw at the end of each of its turns, ending the poisoned condition on a success. Legendary Resistance (2/Day). If the radscorpion queen fails a saving throw, it can choose to succeed instead. Claws. Melee weapon attack: +11 to hit, reach 5 ft., one target. Hit: 15 (3d6+5) slashing damage. Sting. Melee weapon attack: +11 to hit, reach 5 ft., one target. Hit: 18 (2d12+5) piercing damage and 24 (3d12+5) poison damage. The target must make a DC 20 Constitution saving throw or be poisoned. The target may repeat its saving throw at the end of each of its turns, ending the poisoned condition on a success. The Radscorpion Queen can take 3 legendary actions, choosing from the options below. Only one legendary action can be used at a time, and only at the end of another creature’s turn. Spent legendary actions are regained at the start of each turn. Attack. The radscorpion queen makes an attack with its claws. Detect. The radscorpion queen makes a Wisdom (Perception) check. Charge (costs 2 actions). The radscorpion queen moves up to its speed then makes a melee attack. Intense Venom (costs 2 actions). A creature that has the poisoned condition because it was hit by the radscorpion queen’s sting must make a DC 20 Constitution saving throw, taking 24 (3d12+5) poison damage on a failed saving throw or half as much on a success. Smackdown. An adjacent creature of the radscorpion queen’s choice must make a DC 19 Dexterity saving throw or be knocked prone.